JNN 05 April 2014 Manama : Around 20,000 mainly Shia protesters again marched in Bahrain calling for democratic reforms in the Wahabi-ruled kingdom. The peaceful demonstration took place west of the country’s capital of Manama on Friday, just two days ahead of the annual F1 race. 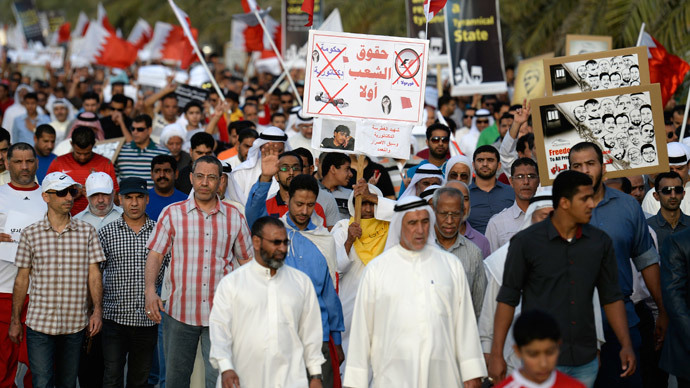 The march was organized by the main opposition group Al-Wefaq National Islamic Society, which is leading the Shia majority’s campaign for greater rights and representation in the minority-led nation. “This week, people from all around the world are in Bahrain to attend the F1. I want to know what are we, as Bahrainis, benefiting from it,” Mariam Jassim, a mother of three, told Reuters. The demonstrators waved flags and posters while demanding reforms and the release of prisoners. “The people demand democracy and reject tyranny,” one of the posters read in Arabic and English. 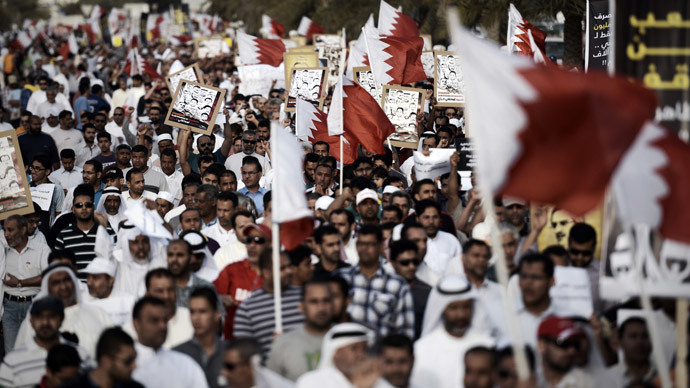 The Shia population of Bahrain complains of discrimination and lack of democracy in the oil-rich kingdom, while the Wahabi monarchy often accuses its archrival Iran – a Shia powerhouse – of instigating unrest in the country. The Friday march comes one day after an anti-government rally during which protesters threw petrol bombs and clashed with police following a funeral procession in the Shia village of al-Eker, located south of the capital. Officers used tear gas and birdshot at the demonstration. Anti-government protests have been taking place in the tiny island nation since the start of Arab Spring revolutions across the region. The kingdom, which hosts the US Fifth Fleet, brutally cracked down on the popular uprising in 2011 with the help of its Wahabi allies – Saudi Arabia and the United Arab Emirates. This entry was posted in Middle East and tagged al-Wefaq National Islamic Society, Bahrain, F1, Mariam Jassim, peaceful demonstration, Revolution, Shia Majority, Shia Population. Bookmark the permalink.